The physical presence of a tumour in the brain can cause problems with some mental (cognitive) functions. These include thinking, understanding, learning, attention/concentration, problem solving, planning and making decisions. What sort of cognitive impairment might I develop? 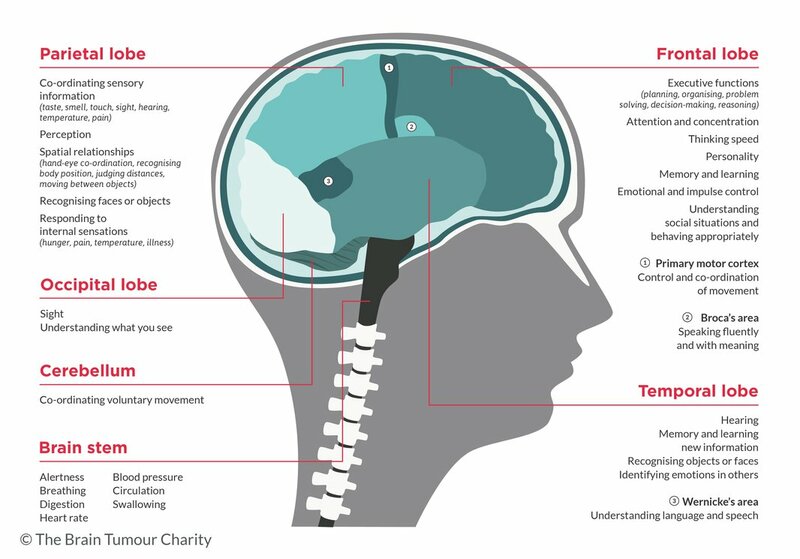 It is important to remember that not everyone with a brain tumour will have cognitive effects and that, if you do experience cognitive effects, brain tumours tend to affect some, but not all, abilities. Finding it difficult to focus on a task and to finish it. Losing the thread of conversations. Not being able to concentrate on more than one thing, such as when you are in a crowd, or several people are speaking at once. 'Executive functions' are processes of the brain involved in planning, organising, problem-solving, decision-making and reasoning. When shopping, not being able to decide on suitable substitutes, such as butter instead of margarine. Being unable to cook ingredients to be ready at the same time. Not being able to put the laundry out to dry whilst still remembering to attend to the cooking. Difficulties in controlling your emotions, leading to rapid mood changes. Making decisions that appear spontaneous or out of character. Thinking speed may be slower, making it more difficult to keep up with conversations. Reaction times may be slower. This can be socially isolating and affect your relationships and ability to work. Forgetting, mispronouncing or using the wrong word, or putting them in the wrong order. This can make it difficult to express your thoughts. Difficulty understanding words (written or spoken) or numbers. difficulty carrying out a movement or task, even if you understand what you need to do. What can cause cognitive impairment? It is important to realise that not everyone will have cognitive impairment, and if you do, you are very unlikely to experience all these cognitive effects. Your experience is personal and likely to be different from another person affected. There are various factors which will affect whether you are likely to experience cognitive impairment and what type of impairment you might have. It is important to remember that this division is not definitive and that tumours in one lobe/area can cause difficulties with cognitive functions that are listed under another lobe/area. In some cases, the removal of the tumour and the pressure it was causing on the brain, can lead to an improvement of cognition. However, it can also lead to negative cognitive effects by causing swelling and increased pressure in the brain. These are generally temporary until the swelling reduces. Steroids may be given to help with this. Removal of brain tissue, by its very nature, can affect the cognitive function which that particular part of the brain controls. Read more about brain surgery. Although radiation to healthy cells is kept to a minimum, radiotherapy can damage the blood supply to brain cells. This can cause swelling or fluid retention and press on the brain. This is called 'radiation induced encephalopathy'. Or it can cause a lack of oxygen and nutrients. Over time, this can lead to the cells dying. You may hear this called 'radionecrosis'. As a result, cognitive impairment can develop months or even years after radiotherapy treatment. It can also cause any existing impairment to get worse over time. Problems, particularly with memory and concentration, after having chemotherapy are common. This is often referred to as 'chemo brain' or 'chemo fog'. The changes are usually mild, but can affect your quality of life. Steroids, prescribed to reduce swelling, headaches or nausea, can cause mood disturbances, problems with attention/concentration and memory impairment. They can, however, improve cognitive problems by reducing the swelling or retention of fluid (oedema), thereby reducing the pressure on the brain. Occasionally, if given high doses whilst in hospital, some people experience 'steroid-induced psychosis'. These effects are usually temporary whilst taking the steroid, but if you experience any of these symptoms, please discuss it with your health team immediately. AEDs (Anti-Epileptic Drugs) can cause impaired memory, impaired attention and effects on executive functioning, such as slowness in thinking. Discuss any side-effects with your health team, as they can change you to other AEDs. Over the counter medicines i.e. ones you can buy without a prescription, can affect cognitive functioning. Talk to your health team about any possible side-effects. Seizures can cause memory difficulties, slower processing speeds and problems with attention and executive functioning. Fatigue is a common side-effect of the stress of diagnosis and future uncertainty, and of treatments or medications. Fatigue is well-known to cause issues with memory, attention/concentration, planning and organising. People often feel anxious and depressed after a brain tumour diagnosis. Changes in your personal, social and/or professional life can add to these feelings. These reactions and associated mood changes often negatively affect cognitive functions, such as motivation, attention/concentration and memory. If you are not eating well, cognitive effects can become worse. Eating well can combat fatigue and make your body more able to cope with the side-effects of treatment. Alcohol has a general 'depressive' effect on brain activity, leading to slowness of thinking and reaction times, impaired reasoning and memory problems. While some cognitive effects may be long-term, others will be temporary or may be able to be lessened by 'cognitive rehabilitation' therapies. Are there any treatments available for cognitive impairment? There is no simple 'cure' for cognitive impairment, but your health team can work with you, as they will be familiar with your specific diagnosis and circumstances, to help improve your cognitive functioning. If you think you, or a loved one, may be suffering from some form of cognitive impairment, you can ask to be referred to a neuropsychologist for an assessment. What can I do to cope with cognitive difficulties? It is not unusual to feel frustrated, defensive or embarrassed about the changes in some of your abilities. Try some of the general coping strategies below, which other people have found useful for day-to-day living. Break tasks down into small chunks and only do one thing at a time. Use prompts e.g. a timer when cooking, or pill reminder for medication. Make receiving information easier e.g. ask people to keep things simple, write it down and repeat it back to them; and try to remove background noise. Use memory aids/techniques e.g. notebook/iPad/mobile, notepads around the house, alarms, diaries, photos of tasks or stages to work through. Talk to others about how you are feeling and the difficulties you are experiencing so they can support you. Do something relaxing each day – it can improve concentration. Get enough rest – plan time for a nap or take a break if you are tired. Try to achieve a regular sleep pattern. Find out more about cognition and brain tumours in the full fact sheet. Find out more about cognition and brain tumours in the full fact sheet - Clear Print version, designed to RNIB guidelines.